EUR is acting weak against the strong USD. EURUSD is chiefly under the influence of positive Producer Price Index in Germany, Presidential debates in France and Weidmann’s speech. The support rests at 1.07300 with resistance at 1.07770 which both lines are above the weekly pivot point at 1.07060. The EMA of 10 is moving with bullish bias along the ascendant channel and it is above the EMA of 100 and 200. The RSI is falling towards the 50 level, the Stochastic is showing upward momentum and the MACD indicator is in positive territory. The ADX is not showing any clear signals. 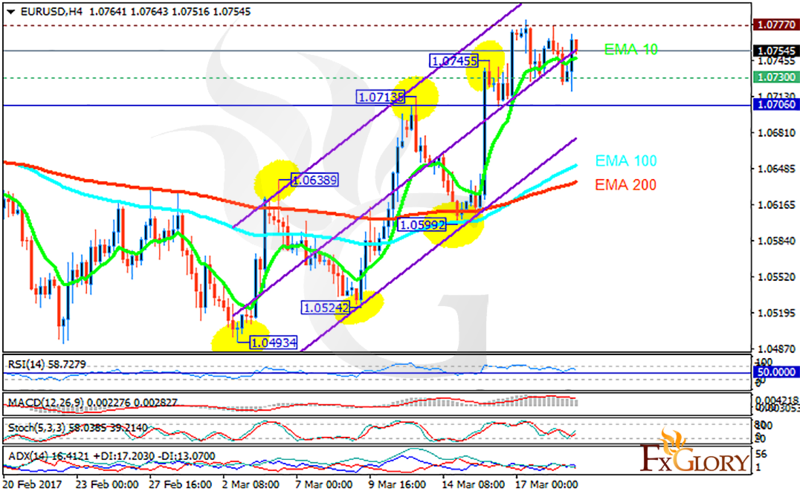 It seems that the pair is creating its correction pattern therefore short positions are recommended targeting 1.070.